Are these non-combat Apache attack helicopters? 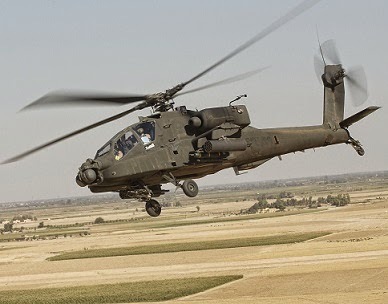 The U.S. military has introduced low-flying Apache attack helicopters into the fight against the Islamic State in Iraq and Syria (ISIS), a development that some experts say brings U.S. troops closer to combat. Previously, the U.S. has only used fighter aircraft, bombers and drones to strike ISIS targets. Using the slower-flying helicopters, which can fire with more precision, could expose U.S. troops to more risk, experts say. On Friday, Time reported that Iraqi officials said an Mi-35 Iraq military attack helicopter was shot down by ISIS militants in Northern Iraq with a rocket launcher. The helicopter’s pilot and co-pilot were killed. Some experts say using the helicopters is an admission that an air-only campaign by fighter jets and drones has failed to stop ISIS’s momentum, and shows that more needs to be done. “It’s definitely boots in the air. This is combat, assuming U.S. Army guys were flying the helicopters,” Jeffrey White, a defense fellow at the Washington Institute for Near East Policy and a former Defense Intelligence Agency analyst, told McClatchy. “Using helicopter gunships in combat operations means those forces are in combat,” he said. They were fighting before the United States was formed. They'll be fighting well after we are gone. Quit arming them. I believe the arms they are using are mainly from the US arms that were supplied to the Syrian opposition a couple years ago. Now we're going to arm the present "opposing forces" also. We'll be fighting against these arms in another two years. And to add the fact that we KNOW it, it's stupid to poke our nose in this fight. Quit arming these goons, and we won't have to be fighting against them in a few years. Senseless, needless, and just plain immoral.